This laminator machine uses recirculated hot air to shrink thermoplastic tubing down to a minimal diameter for the production of catheters. Four catheters can be processed at once using two heating chambers with two process areas in each reflow chamber. 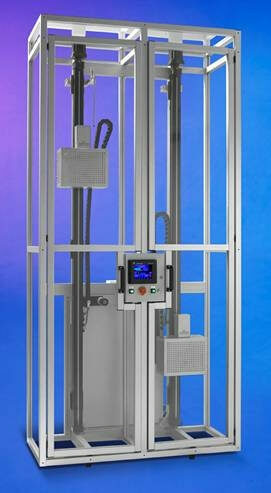 The machine operates vertically to minimize the require floor space. The enclosure isolates each side for improved process control. This machine, as well as the non-enclosed version, is CE certified for worldwide use. Catheters are the primary products but the flexible programming capabilities enable the machine to laminate everything that can be held by the mount collets. The precise control of all variables is increasingly important, as the process specifications get tighter. Programmable temperature and variable speeds enable heat-shrinking tubing close to the melt temperature. The unique use of a patented hot air recirculation process allows hot air to be contained within the system, instead of being expelled to the surroundings. This also helps maintain a precise steady state temperature. Temperature offsets allow calibration by external probes. The long heating area maximizes the time at temperature for faster processing which allows this machine to shrink tubing faster than any other. Pneumatic setups are not necessary with this model’s innovative design. By improving the accuracy of all controlled parameters, this machine can increase productivity through reduced rejects and faster processing speeds. Laminating rates of 10 times that of other machine types is possible due to the increased length of the heated zone. The programming is flexible to allow new products to be made with the same machine. With the availability of better technology, product designers are finding they can build better products. The 4 shrink areas operate in parallel so the production for a given floorspace is maximized.